KCNAThe launch of the Hwasong-15, the missile North Korea tested last Wednesday. Crew onboard a Cathay Pacific flight last week said they witnessed North Korea’s latest missile test. The plane, which was flying from San Francisco to Hong Kong, was over Japan at the time. The flight “remained normal,” the airline said. Crew onboard a Cathay Pacific flight last week claimed to have witnessed North Korea’s latest intercontinental ballistic missile test. The CX893 service, which was flying from San Francisco to Hong Kong from November 28 to 29 local time (HKT), was over Japan when North Korea’s Hwasong-15 missile was launched, flight trackers indicated. 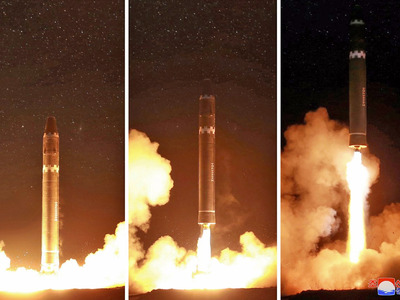 Pyongyang tested the Hwasong-15 around 3 a.m. last Wednesday local time (PYT). Experts said it could have reached any part of continental US. The Cathay Pacific flight’s “operation remained normal and was not affected,” the Hong Kong-based airline told Business Insider in a statement. 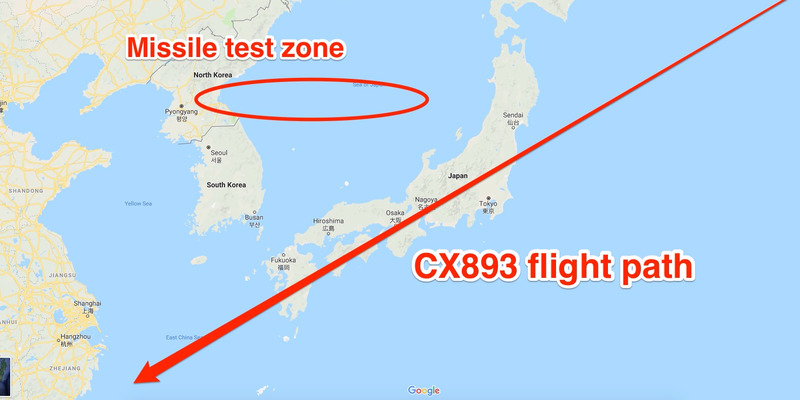 He added that a separate Cathay Pacific flight, CX096, “might have been the closest [to the missile test], at a few hundred miles laterally,” although there have been no reports from that flight’s crew. While airlines can reroute flight paths to avoid such incidents, according to SCMP, Cathay Pacific said neither it nor other carriers were “changing any routes or operating parameters” at the moment. Korean Air, a South Korean airline, also said two captains of its passenger planes saw flashes believed to be from the North’s missile test while flying over Japan last Wednesday, the Associated Press reported. Google Maps/Business InsiderThe Hwasong-15’s missile test zone and CX893 flight path. While Cathay Pacific’s flight last week wasn’t impacted, and there is generally a low chance that a North Korean missile will hit a plane, experts say Pyongyang’s missile tests could still endanger future commercial flights. A missile test “would create a debris field that could be a risk to aircrafts at high altitude,” Ankit Panda, a security-focused editor at Asia-Pacific news magazine The Diplomat, told the BBC. Earlier this year, Air France imposed a no-fly zone over North Korea after one of its flights flew past the site of Pyongyang’s July 28 missile test over Japan. “On 29 November, the flight crew of CX893 reported a sighting of what is suspected to be the re-entry of the recent DPRK test missile. “Though the flight was far from the event location, the crew advised Japan ATC according to procedures. Operation remained normal and was not affected. “We have been in contact with relevant authorities and industry bodies as well as with other carriers. At the moment, no one is changing any routes or operating parameters.